Assassin's Creed: Lost Legacy was once planned for the 3DS, but then became a full console experience that was revealed as Revelations. If you'll recall back to Nintendo's 3DS reveal at E3 2010, you may remember that it initially had an incredible-looking lineup of games that for whatever reason or another, never really materialized when the system launched. Well, now we know why the promised Assassin's Creed game for the system vanished into thin air - according to series writer Darby McDevitt, the concept turned into Assassin's Creed: Revelations. "You may have heard of the game Lost Legacy for the 3DS. It was announced, but that kind of morphed into this idea," McDevitt told Joystiq. "The story that was announced about Lost Legacy was that Ezio goes to Masyaf and investigates the holy land," which - with its direct ties to Altair and the first AC - does sound an awful lot like what we know about Revelations. This doesn't mean that Ubisoft is just making its story up on the fly, said Dewitt, who said that the concept that would eventually become Revelations (and presumably Lost Legacy) first came into being in February of 2010 - before the release of AC: Brotherhood. 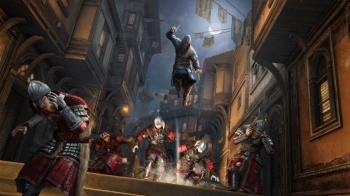 "We do a lot of thinking ahead of time on big arcs, like knowing where Ezio is going, knowing where Desmond is going, knowing where Altair is going," said McDevitt. "The major beats of all our characters' stories are planned well in advance, so we don't get Lost-itis where we're opening up more than we could possibly close off." I don't know - I think a game where the Assassins crashed on a tropical island and had to contend with smoke monsters, the Templars and confusing writing might be kind of interesting. But that's just me.